The VX-9 Vampires and VX-31 Dust Devils are two squadrons based at NAS China Lake, and they use the Jedi Transition quite a bit due to its proximity to the associated ranges. VFA-122 Flying Eagles out of NAS LeMoore are tasked with the training and requalifying of all west coast pilots for the F/A-18E and F/A-18F Super Hornets, so they also use the canyon and airspace very often. All the other operational squadrons from LeMoore use the China Lakes ranges for various types of training, and they can fly from low level all the way up to 40,000 feet. 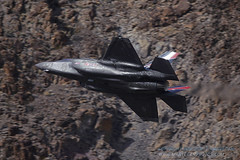 Most of the USAF tests originate from Edwards AFB, and are performed at higher altitudes, but some of their aircraft do frequent Rainbow Canyon for low level flight. These are usually T-38 Talons or F-16 Fighting Falcons.